Do you think that will be possible to use JDE in IPad? I was thinking about that. I've tried many times with my Iphone, but it not works. Actually the JDE logon screen opens, I can enter with the user/passwd, select the login environment and I got into JDE. But when I try to open a program, no grid or form appear, nothing. And about you? Do you think IPad is good for business? Is IPad good for JDE? 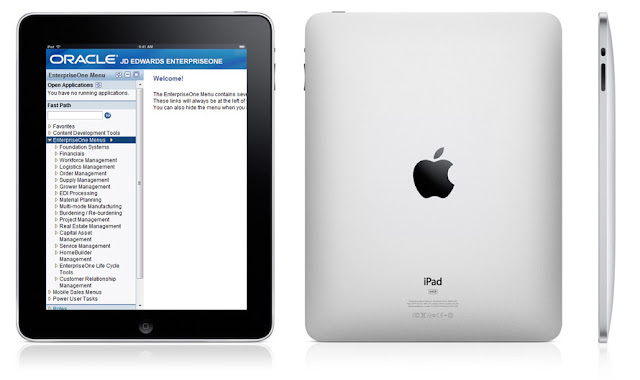 Is someone available to develop JDE Solutions for IPad? If so, please contact me and we can start a project to deliver JDE to IPad platform. In this meantime, follow an "JDE IPad Concept". Interesting. I still remember back in 2007/2008 when the first iPhone just got released, going to the Apple store on 5th Avenue in Manhattan and picking up one of the display units. The first thing I did was navigate to the client's JDEdwards 8.11 URL. I was able to successfully log in, and even run applications in E1. And this was a first-generation iPhone! I wonder what changed between then and now. I have found a workaround for using JDE on an ipad. 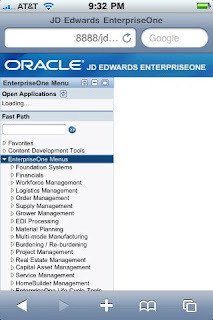 We have an external webpage to access JDE. 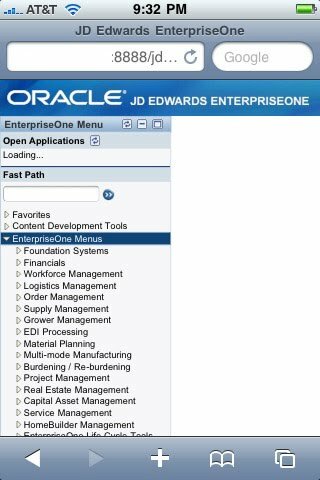 As you know mobile safari will not render the JDE application pages. First you need the Atomic Browser (.99cents). Under settings you can change the web rendering options to IE or Firefox. After changing that setting I am able to access full functioning JDE. Not allowed to use restricted network port"
Sorry but my english is very bad.